"A moist and flavorful comfort food. Very easy to make. A dish that would please anyone. My family never liked venison until now. I make my own venison burger (mixed with pork and smoked bacon) to die for. Makes the best meatloaf sandwiches or subs (trust me) for work or hunting (awesome cold). Works excellent with beef too. Your friends and family will beg for more. Good thing I like to hunt (the rest of my side of family doesn't)." Mix ground venison, onion, stuffing mix, eggs, Worcestershire sauce, ketchup, vegetable juice cocktail, and yellow mustard in a large bowl with your hands until thoroughly combined. Place half the venison mixture into a 9x11-inch casserole dish; pat the meat mixture into an even layer. Spread morel mushrooms over meat; top with Cheddar cheese slices. Spread remaining half of venison mixture over cheese slices; pat down to form an even layer and press the edges together to seal in the mushrooms and cheese. 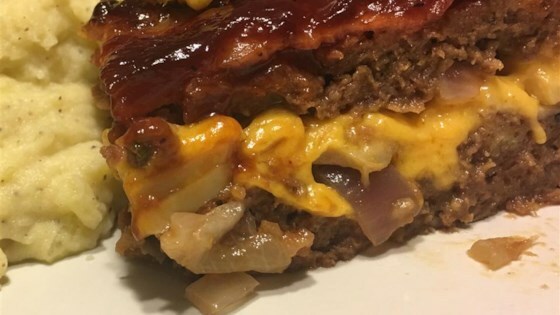 Arrange bacon slices over the meatloaf; spread barbeque sauce evenly over the loaf. Sprinkle with Parmesan cheese. Bake in the preheated oven until the meatloaf is browned and an instant-read meat thermometer inserted into the thickest part of the loaf reads 160 degrees F (70 degrees C), about 1 hour and 15 minutes. Drain excess grease and allow loaf to stand for 5 minutes before serving. May freeze up to 3 months, or longer if vacuum-sealed. Loved this! Didn't change a thing and it was absolutely delicious. Thanks for the recipe! Loved the stuffing! I made this without the bacon and mushrooms and it was real good. Can't wait to try it with ALL the ingredients! AWESOME RECIPE!!! I used beef instead of venison it turned out wonderful!